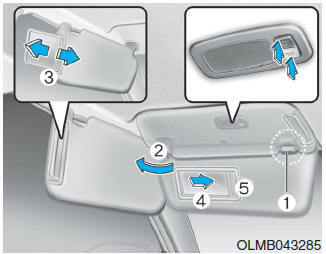 To use the vanity mirror, pull down the sunvisor and slide the mirror cover (4). Adjust the sunvisor forward or backward (3) as needed. Use the ticket holder (5) to hold tickets. Always have the vanity mirror lamp switch in the OFF position when the vanity mirror lamp is not in use. For your safety, do not block your view when using the sunvisor.